Holden Matthews is a 21-year-old pagan living in south Louisiana. He’s been arrested for burning down three historically black Baptist churches. Prior to his arrest, many people believed the church burnings were the work of the Christian organization, the Ku Klux Klan. No one expected the arsonist to be a pagan. Matthew’s statement that Christianity was forced onto black and white people is true. HOWEVER, the way to correct this problem is NOT through more religious violence. The ONLY long term solution to this problem is REASON. And the very best way to unite reason with religious/spiritual thinking and beliefs is through Deism. When we stop and think about why Christians had to resort to violence to spread Christianity, we realize the primary answer is because of the foolishness their Christian teachings were and are. Claims of talking donkeys, dead people coming back to life, and walking on water, plus countless other false and foolish claims, are all claims impossible to sell to anyone who uses their innate God-given reason. This is why Christianity was spread through religious violence. Nonsense ought to be treated as nonsense, wherever it be found; and had this been done in the rational manner it ought to be done, instead of intimating and mincing the matter, as has been too much the case, the nonsense and false doctrine of the Bible, with all the aid that priestcraft can give, could never have stood their ground against the divine reason that God has given to man. As Carol Duff’s recent article points out, 23.1% of Americans are classified as “nones” because when surveyed they state that they have no religion. These results can be misleading by giving the false impression that since they have no religion they are atheists who do not believe in God. However, the vast majority of them hold Deistic beliefs, that is they believe in God without religion. I cover this in my book God Gave Us Reason, Not Religion. 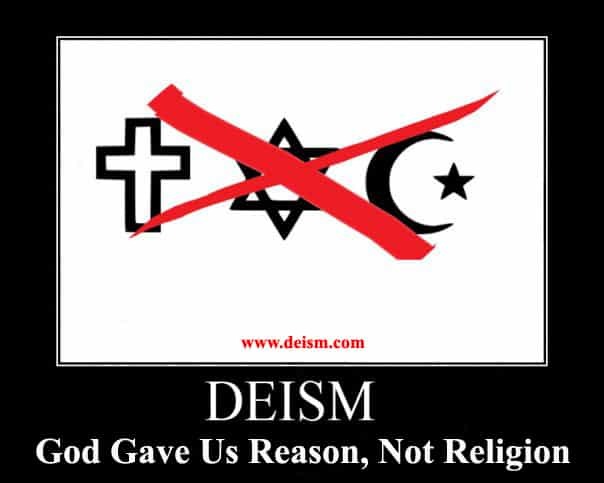 Deism is based on our gift from The Supreme Intelligence/God of innate reason and Nature. Deists have no reason to use violence to spread Deism or to counter the nonsense of the man-made “revealed” religions. Our God-given reason destroys the foolishness of the “revealed” religions. Once we reach a large enough number of people with Deism, the violence promoting “revealed” religions will be no more. They will disappear, due to losing the bulk of their rank-and-file members and the support they give to their “revealed” religions. It’s up to all Deists to DO all we possibly can to promote Deism to as many people as possible if we want to end religious violence before it ends us. Bob Johnson is a freelance writer in the Tampa area of Florida. He was raised Roman Catholic, but after a stint in Marine Corps infantry and reading Thomas Paine's The Age of Reason he became a Deist. In 1993 he founded the World Union of Deists, and in 1996 he launched the first website devoted to Deism. He is the author of God Gave Us Reason, Not Religion, Deism: A Revolution in Religion, A Revolution in You and An Answer to C.S. Lewis' Mere Christianity. He has also written the introduction to Thomas Paine's The Age of Reason, The Complete Edition and Principles of Nature by Elihu Palmer. I was forced to attend a local Baptist church when I was quite young and I hated every minute of it. I also discovered how prejudiced they were. Sorry, not going there anymore. Religion is all about control and nowhere is it more in control than with Christian zionism, a cancer on humanity. Take a population of ignorant, near literate, backwoods superstitious people and feed them a massive lie about Israel, stir well and allow to fester. This is Mike Pence, John Hagee and all the rest of the brainwashed loony tunes. The violence the Judaic religions have visited upon humanity speaks volumes that in itself they are frauds and malicious liars, willing to go to any length to inflict their own version of morality upon everyone else. The planet has been made a grave yard of those who failed to go along with it. I agree with a bunch of what you said . Christians today barely even read the Bible instead pay to sit and be read to and brainwashed into what a great place Israel is . Christian churches today are the fatted calf for the Jew . It could be stated that common sense should prevail in the issue of worshiping gods and goddesses. It is unwise to let another person in the form of priest or priestess, speaking on the behalf of any body that seeks to govern another —- either spiritually or economically through the auspices of an established oral or written dogma ——- to intervene as a conduit between the individual’s soul/spirit entity and the Prime Source energy that created that individual. Stated more simply: One should not allow others to interfere with one’s own connection with the Prime Creator of this universe. Especially those that profess to have an entitled, superior status. There are no “chosen ones”. People really need to learn ancient theological history going back to at least Sumer, paying particular attention to the pantheon of gods and goddesses that, were and are, still worshiped in order to fully understand the detriment of all religions to the concept of life. Particularly the Abrahamic ones as it is they, that have and continue to force their theocratic governmental systems and hateful, vindictive god who has demanded blood sacrifices throughout millenniums of repeated conquests and nearly continuous wars. Please just try to learn history, objectively, without forcing individual bias into the mix ——i.e. ; one must learn to question their own belief systems. Deism works for me with the understanding that there is a bipolarity within this universe….and that the spirituality of any individual should never be dictated by the government, or state. Laws may be written concerning the consensus moral values of any society but laws specifying worship of particular gods/goddesses are totally unacceptable. ” I pray to the sun but I worship Joe Pesci”. George Carlin. Baptist church is very different from authentic Christian church that spread universal love teaching by Jesus. Deism was invented by illuministic minds of Illuminates of Baviera and freemasonry to build possibility of business with the bad people of different religions as now shows the alleance Netanyahu, Trump-Pence and SAUDIT-EOA sunnites. Since 2 thousand years many men try to destroy Christianity. Christianity is alive and those men are died. Sometimes, like Hawking big mind, died in not very good condition. Instead Benny Hinn is in very good health. Benny Hinn is just another charlatan and pick pocket like all the others.